Laura K. Taylor (PhD) is a Lecturer at University College Dublin, Ireland, and Queen’s University Belfast, Northern Ireland. Dr. Taylor brings a significant research experience in understanding conflict, especially among the younger generations born and raised after the conflict. Her work focuses on the peacebuilding processes in Northern Ireland, a context plagued with ethno-religious divisions much like ours in Kosovo. In the past two years, she has been collaborating with colleagues in Kosovo (Edona Maloku) and Macedonia (Ana Tomovska Misoska), to expand this insight onto these contexts and understand better the factors that perpetuate division among children in these divided societies. She makes a great contribution to our Forum Speaker series by providing insight on the developmental aspect of socio-political factors that continue to shape post-conflict generations and does so from an evidence-based perspective. 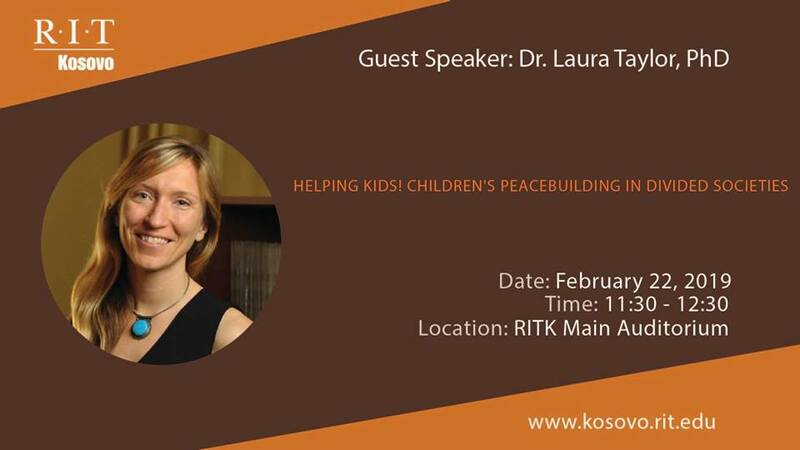 She will be talking about her joint-work in Kosovo and the region as well so that RIT Kosovo community can easily relate and benefit from her talk in a more meaningful way.